Home » Blog » Why stories? Which stories? Add customer stories to your content marketing mix. Numbers give clues but don’t tell the whole tale. Why stories? Which stories? 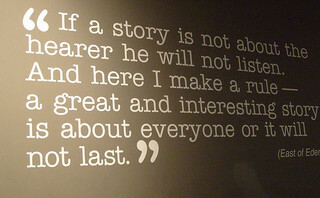 And tips for better stories. Statistics don’t lie, but they also don’t do as much to persuade as you might think. Research and results show time and again that if you want to connect with your key audiences, one of the best ways to do it is to add customer stories to your content marketing mix. Good content is essential. The right words and ideas attract attention, educate, and entertain, all at the same time. Remember, there is an emotional reason behind every buying decision and every ROI calculation. That being said, I recently ran some numbers and found a few more popular Snippets from the past. Web analytics and email activity tell me which pieces of our own content worked the best. Worth a thousand words – Great photos are a must for great stories and content. Here are a few tips on using photos, along with a photo essay on a famous Kansas Citian. Choose wisely – You need to be thoughtful about which stories to tell. Do they fit into your overall marketing strategy? You can find more “good ideas to help you prosper” at our blog. And feel free to pass them along and share them with your friends and colleagues. Have a great week.